Hello everyone! I was originally going to make this one post but decided to split it into two as it started to get quite long. 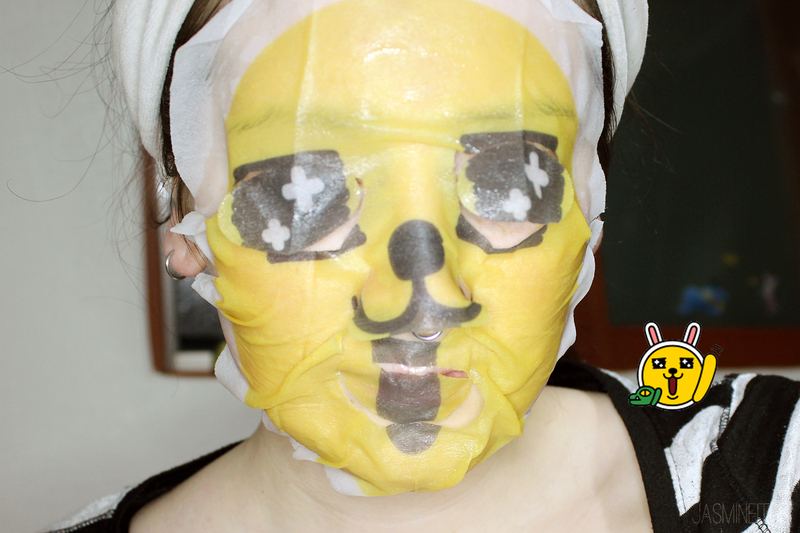 This second and last part is The Face Shop portion of the review. 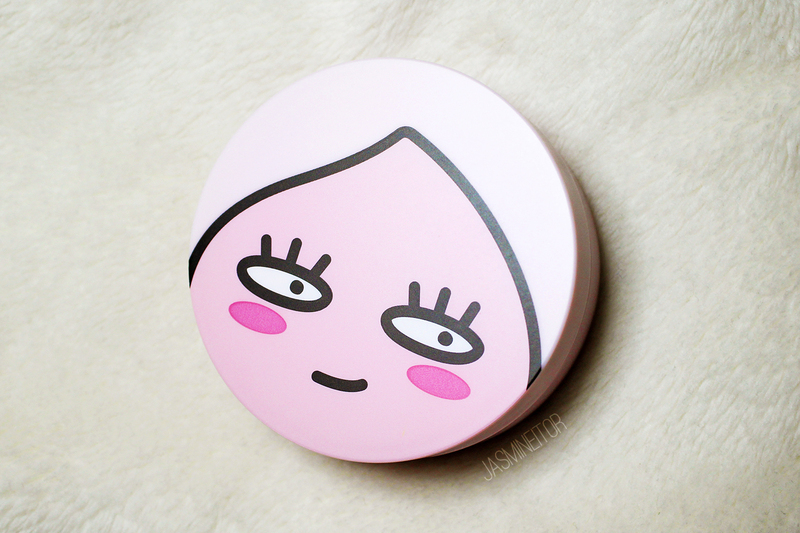 I’ll be reviewing their setting powder, as well as their (horrifyingly amazing) face masks! 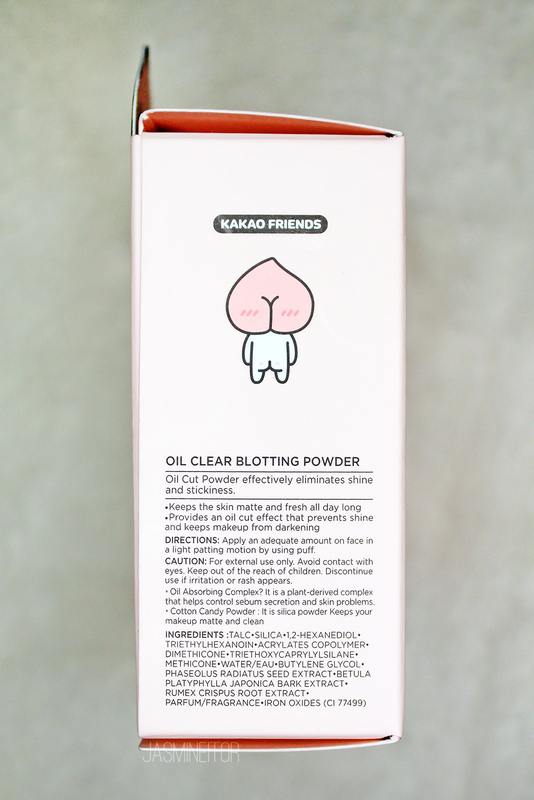 Part 1 of the review with more information on the Kakao Friends themselves can be found here. And this is their new logo and concept! They’re now using a sort of an ancient Greek/Roman feel to promote a “natural” image. I appreciate the change as before I felt they were one of the only Korean roadshops that lacked a unique colour and thus they were one of my least favourite stores. On to the review! Like VDL, The Face Shop is under LG Household & Health Care, so they also own the rights for Kakao Friends cosmetic collaborations. However unlike VDL, The Face Shop came out with a ton of products at once, ranging from palettes, lip products, and foundations, all the way to sunscreen, perfumes, and skin care! 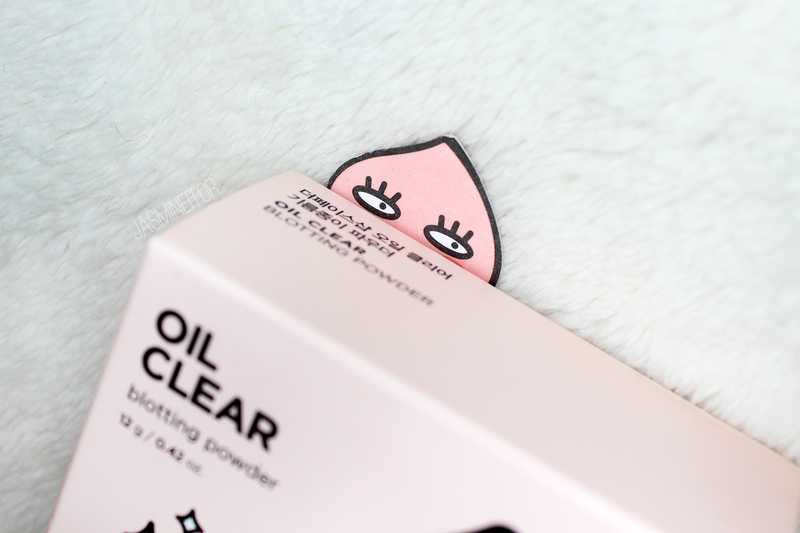 As the colours of makeup they released were quite basic (nothing I don’t already have), I decided to go with a product that is both adorable and affordable! 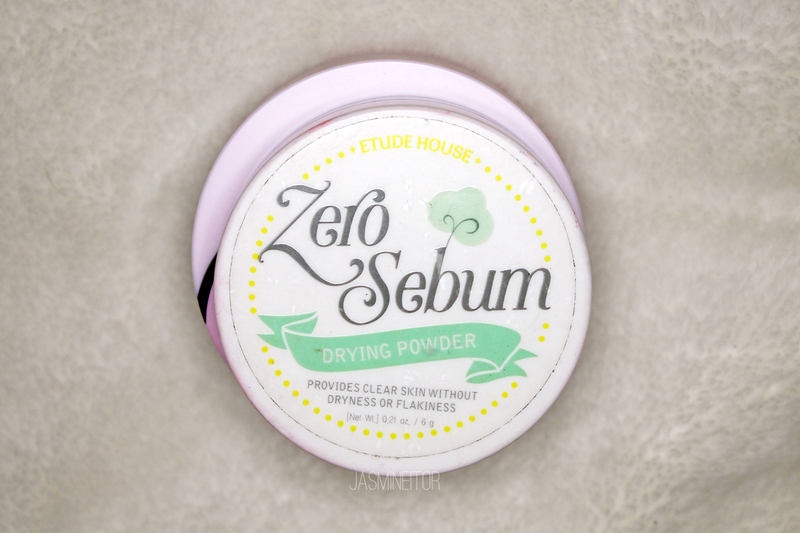 Since hearing that Etude House is discontinuing their Zero Sebum Drying Powder, I’ve been looking for replacements and figured why not try one of The Face Shops new formulations? …which is the excuse I told myself, because honestly I got it just because of how cute it is. Upon taking it out of the box you are greeted by this giant Apeach face. 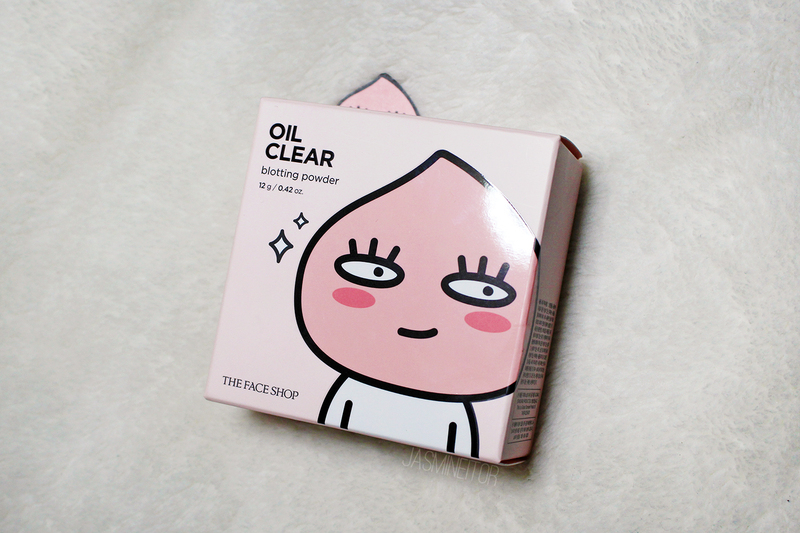 The packaging is solid and light, with a powdery matte finish appropriate to the product inside. 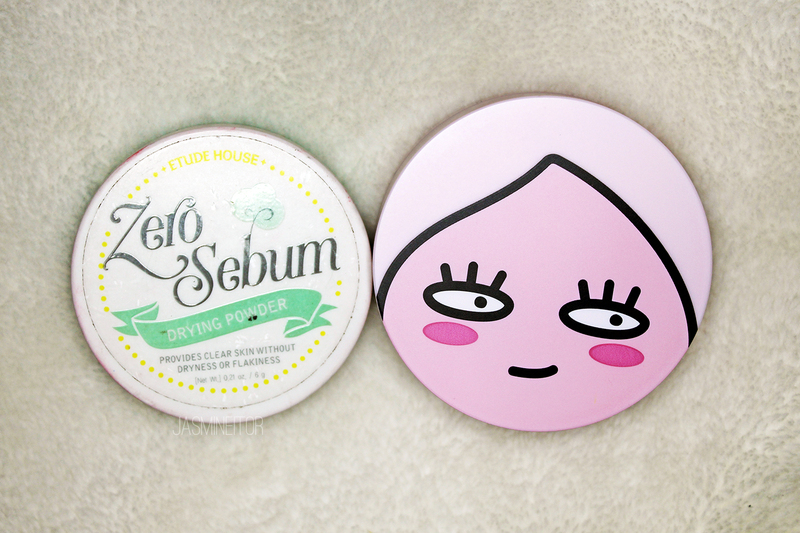 As you can see above, this product is quite a lot bigger than the Zero Sebum one (6g for 6,500 KRW vs 12g for 8,000 KRW). The packaging has a similar feel when touching it, but higher quality in that the Etude House design is just stuck on with a sticker and the The Face Shop one is actually part of the plastic, which I prefer! 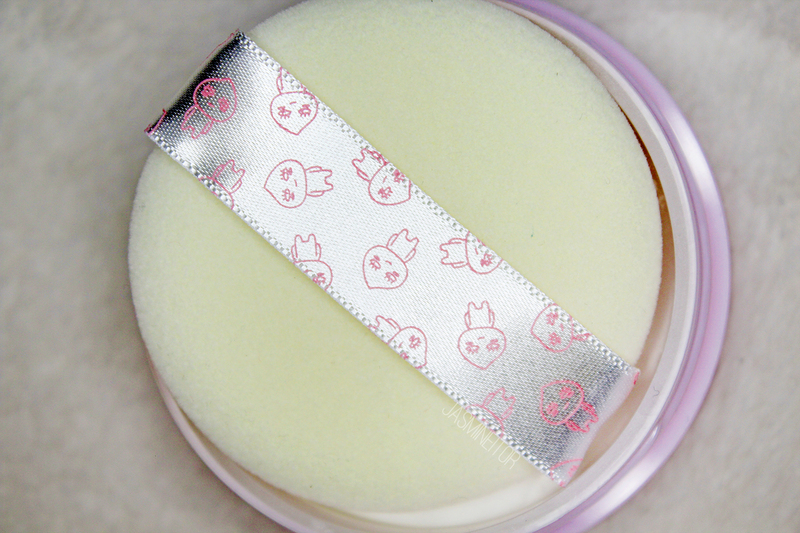 Inside is a big powder puff with adorable Apeach detailing on the ribbon. I’m pleasantly surprised with how good the quality is of this product when you consider the low price point. 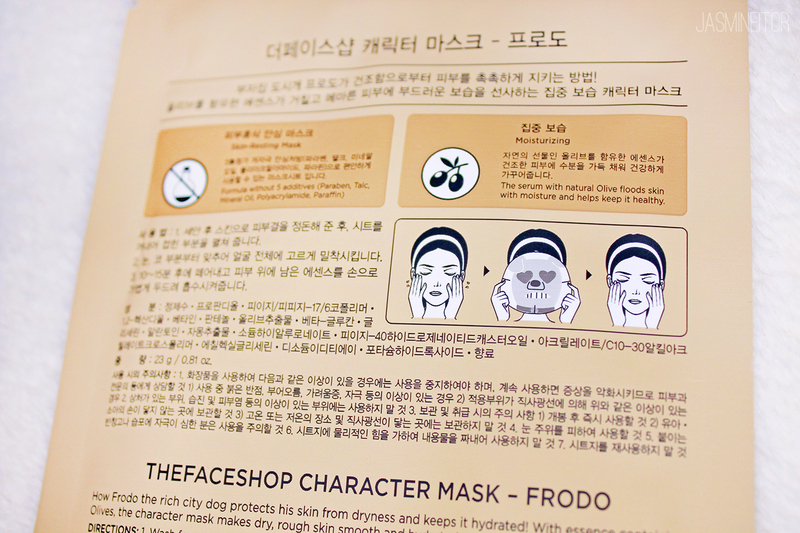 Every detail has been attended to, so I’d say The Face Shop is really stepping up their game! 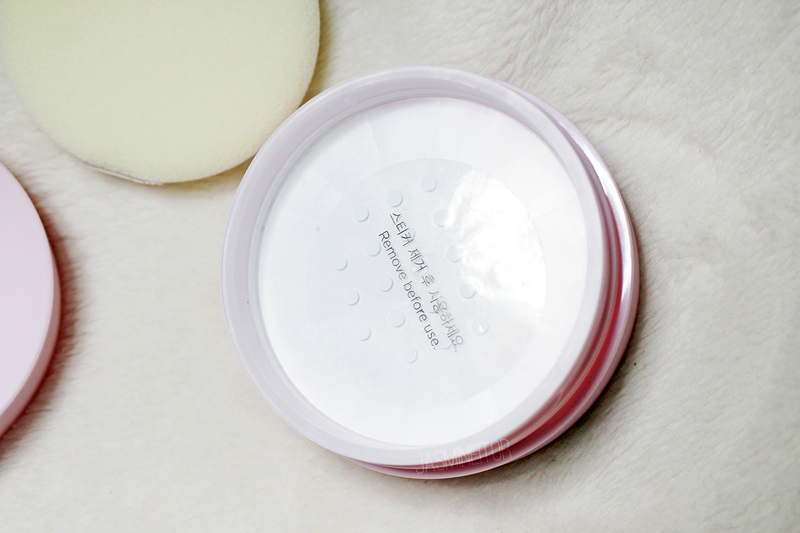 Once you remove the sticker you pat the powder puff on the surface of the holes to get product out. I like to swirl my puff around for more of an even coverage, because I find that patting it makes the hole pattern stick on my face just like that! Unfortunately I haven’t opened the product yet to test it since I am waiting to finish my Etude House powder, but once I do I will update my Instagram with my thoughts. Now onto the long-awaited part of this post! 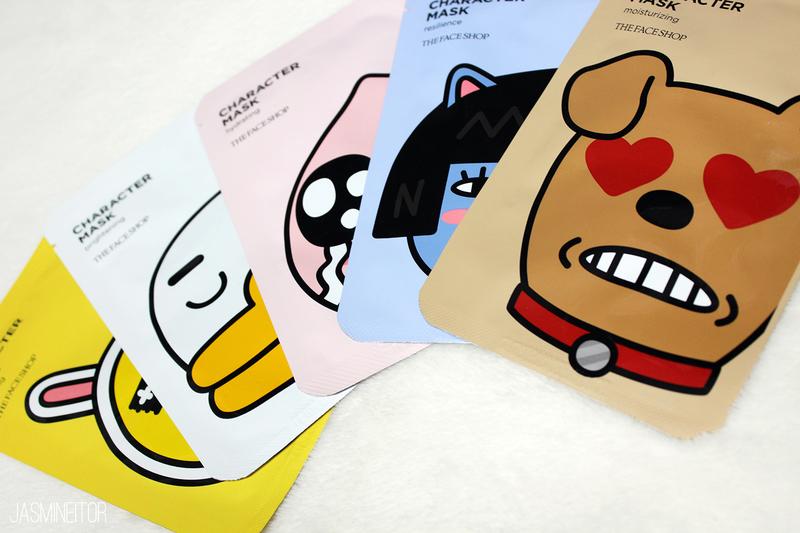 I will review each mask one by one so if you’re looking for a specific mask you can search the Kakao Friend’s name to go straight to that mask’s review. 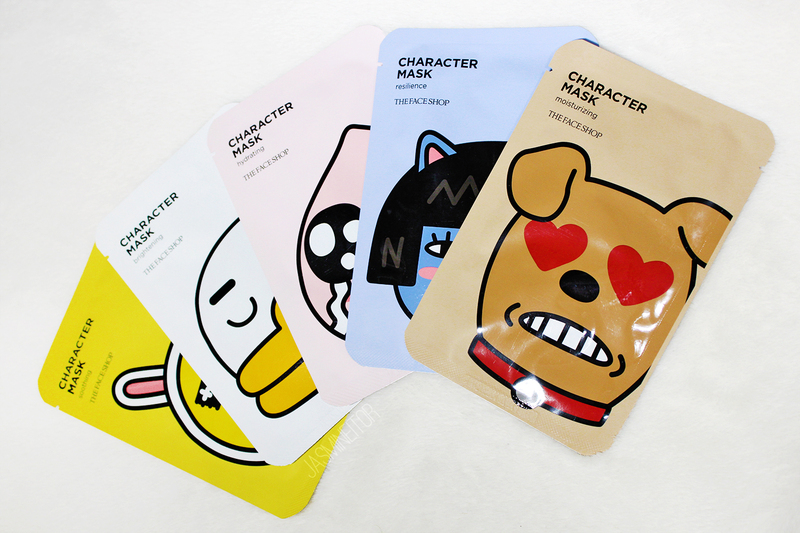 Each mask has a customized description based on each character’s personality. 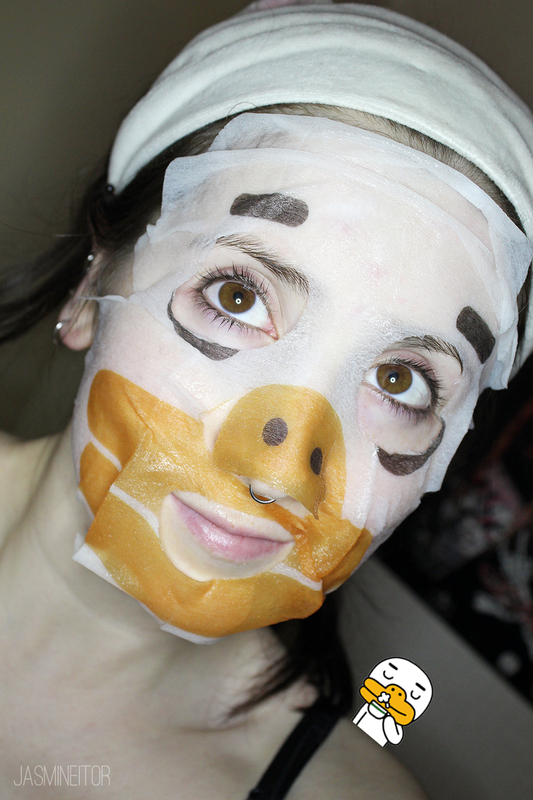 This mask claims to use the power of Apple Extract to sooth irritated skin. 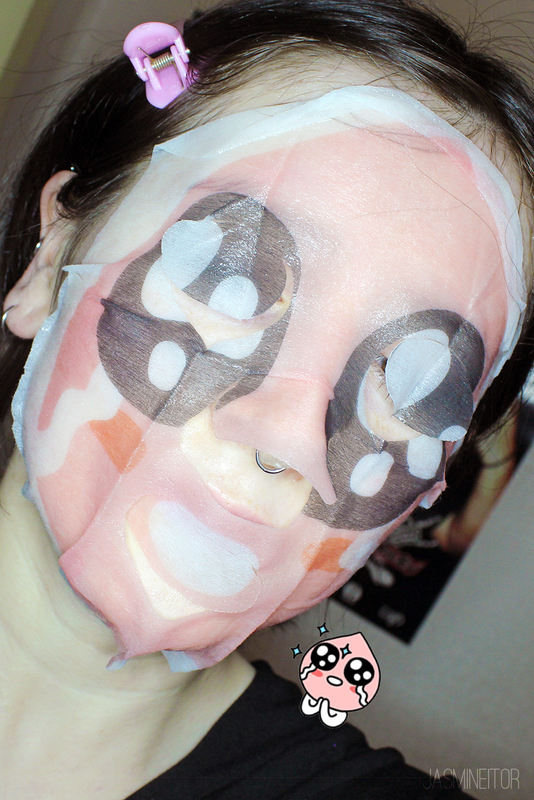 The mask is also annoyingly large and the nose hole fit more over my mouth than the actual mouth hole did. Once I flipped up the eyes and removed the mouth cover I found myself having to fold over the mask in several places in order for it to line up somewhat properly. 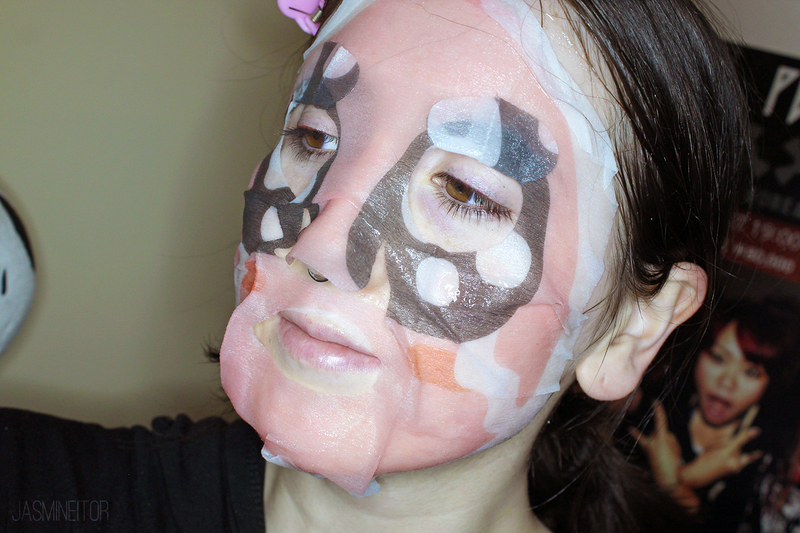 Despite the folding it was still very uncomfortable around my mouth because the nose hole kept sliding down my face and resting on my lips 🙁 I had some skin irritations this day which is why I decided to do this mask in particular. It is full of serum and still felt very moist even after 20 minutes. As for the effects, it made my skin feel quite soft and moisturized for quite a while after using it! 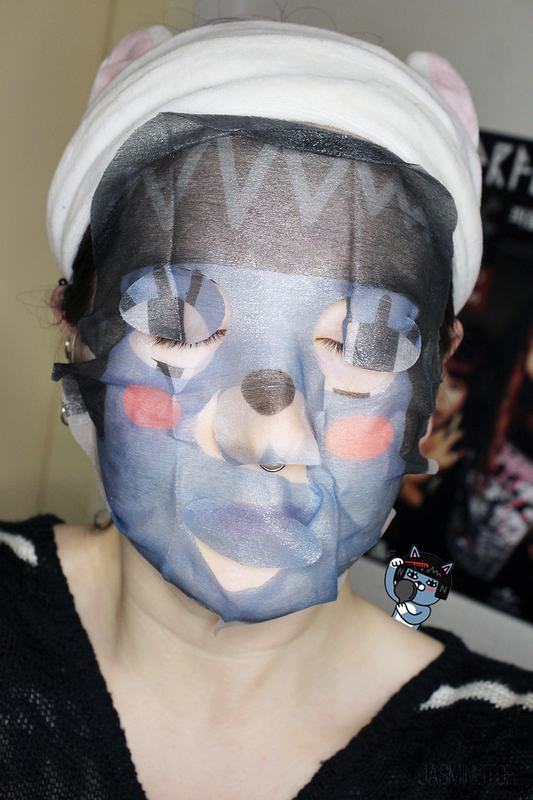 While it was on it did feel soothing and cooling, but that’s an effect I find most sheet masks to have. Not bad! Next is everyone’s favourite, Apeach! 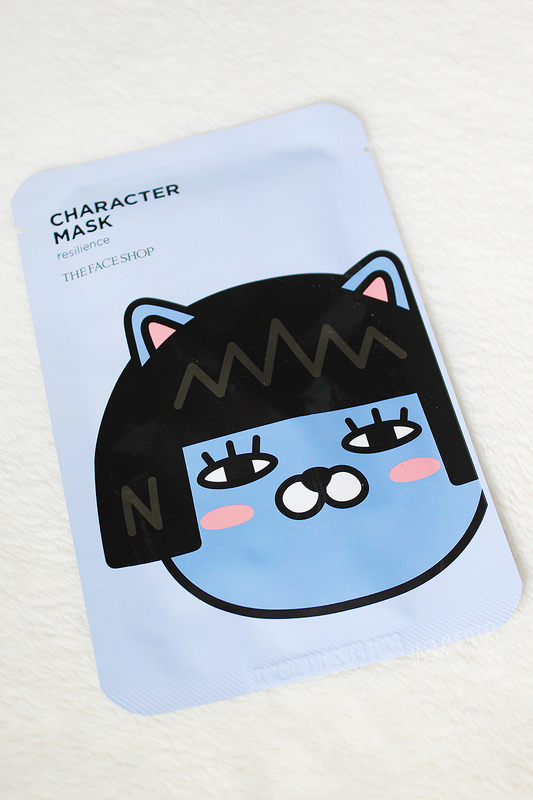 This is another “food brought to life” character so I had high hopes for the cuteness factor of this mask. 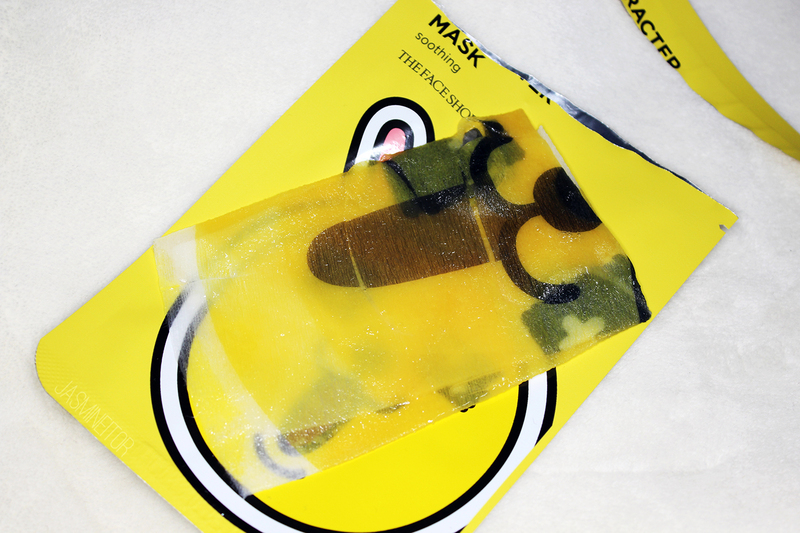 This mask claims to use Hyaluronic Acid to moisturize your skin. 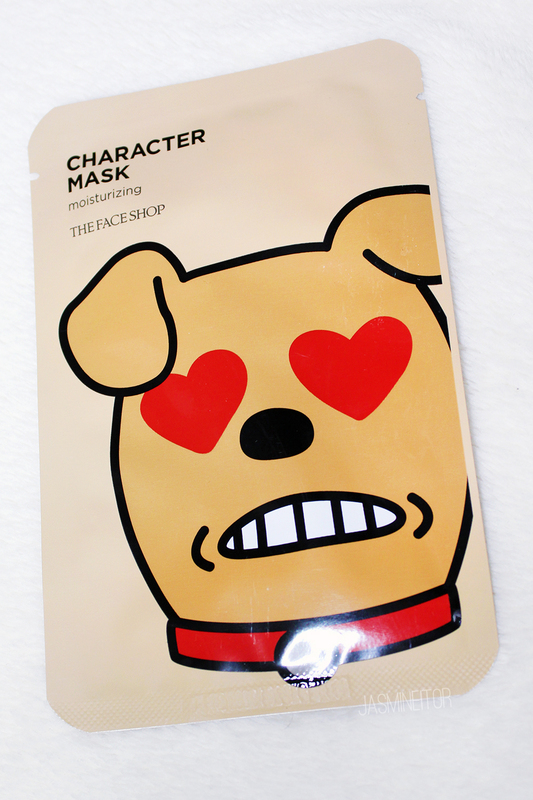 I didn’t mention it with the previous mask but these masks all have a similar, very faint scent. 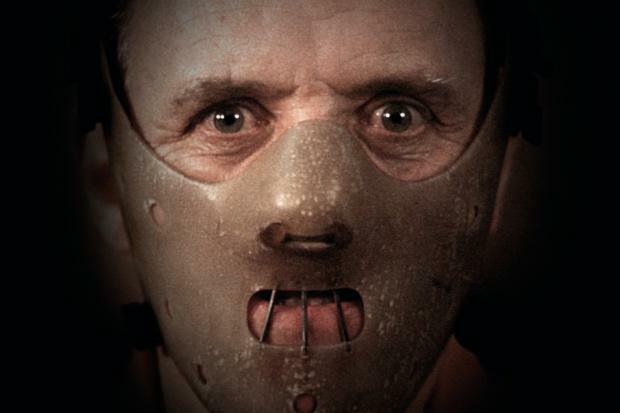 I don’t like scented masks so I was glad to find that the fragrance was barely noticeable. More like a giant fly than a cute peach! Here you can see the issue with the nose hole hanging down towards my mouth. 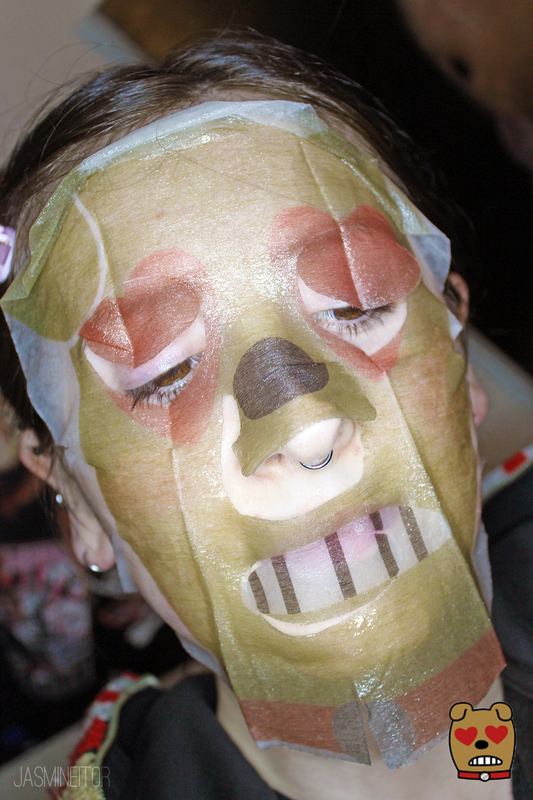 This one isn’t nearly as horrifying as the previous one when you flip up the eyes! 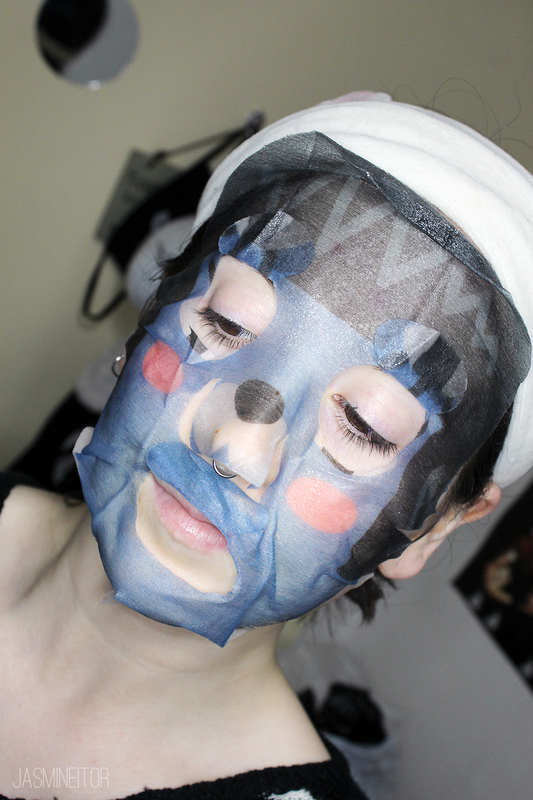 As for how well the mask worked, I liked this one a lot! The moisturizing effect worked great and my skin felt hydrated after. 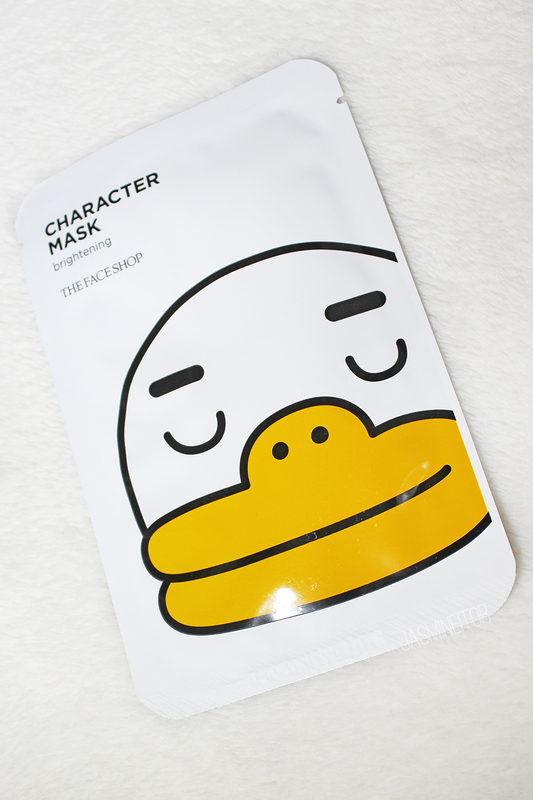 I feel like the mask not smelling like peaches was a missed opportunity, but this is my second favourite of the line due to its long-lasting hydration effect. Neo, the fashionable cat, is in charge of “resilience”! 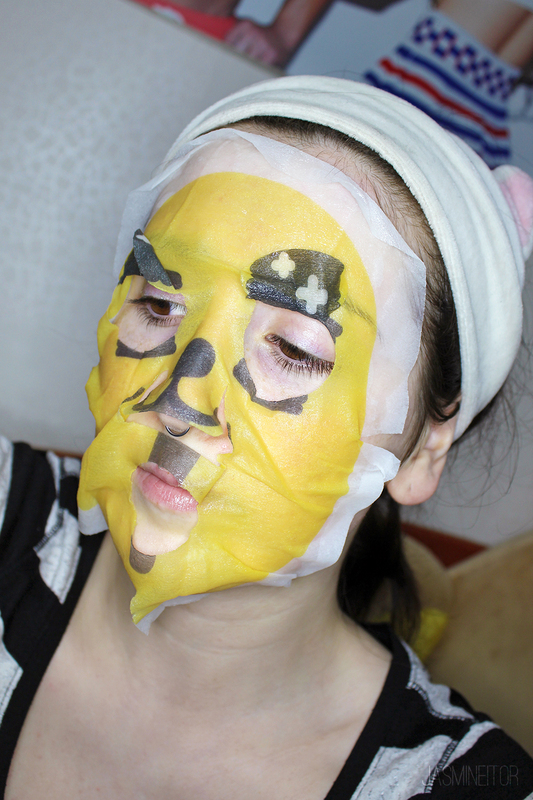 I understand the use of masks for long-term wrinkle prevention but I can’t imagine using a mask once would make a difference for wrinkles so it’s a little difficult to review this one! 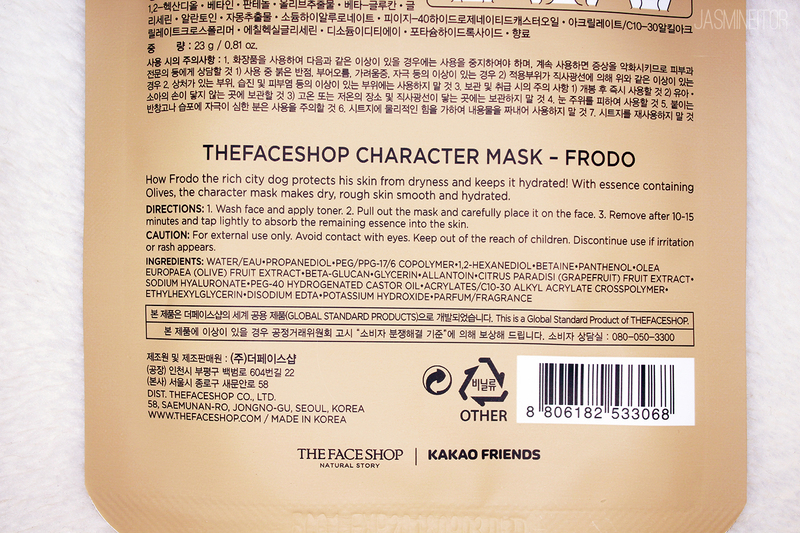 I guess the biggest difference between these masks are that the Apeach one contained acids and this one contains olives. 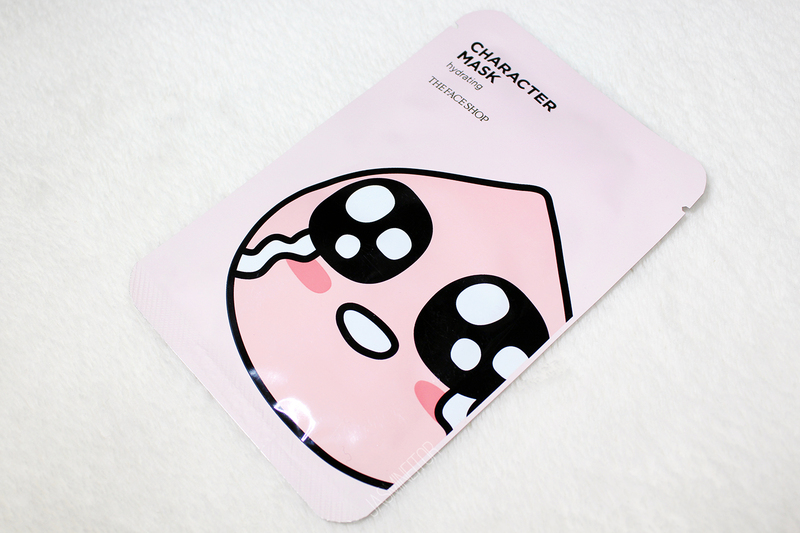 If I had to choose between this mask and the Apeach one for hydrating factor I’d say the Apeach one definitely wins. This one wasn’t bad at all, it worked fine, but the Apeach one was better in that my skin felt hydrated and soft for much longer than this one. 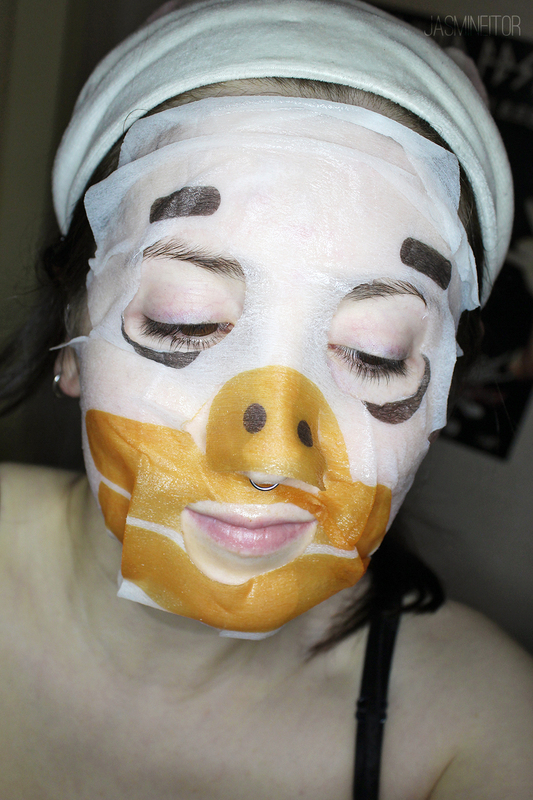 Finally the last mask, based on the easily angered duck, Tube! 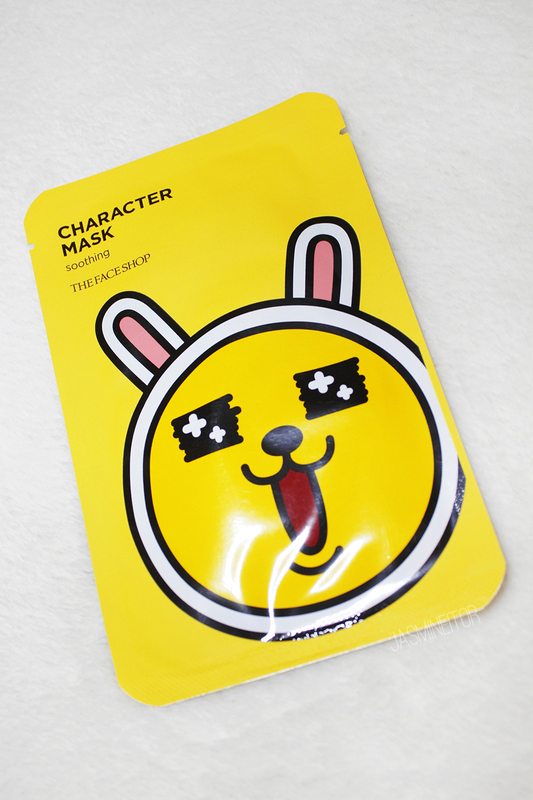 This mask’s main ingredients are cotton seed and niacinamide for a brightening effect. Me encantó la dedicación que le pusiste a estos posts. 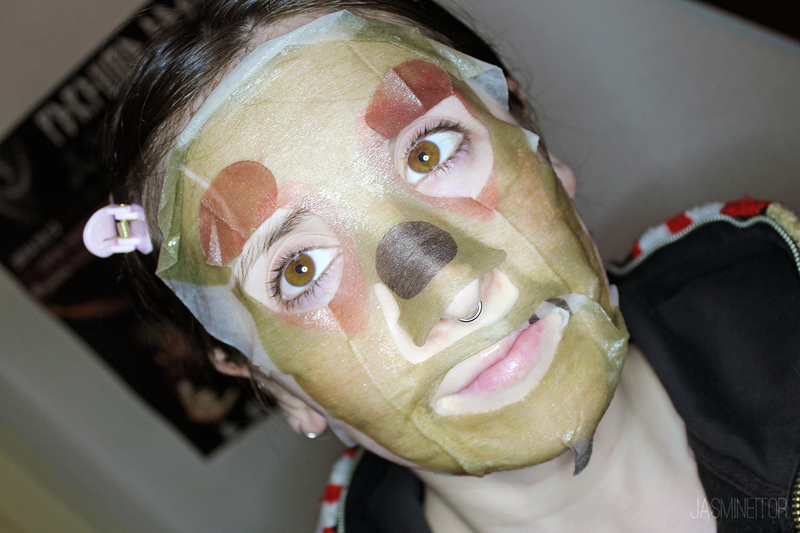 Vi primero en Instagram las fotos usando estas mascarillas y claramente son muy grandes, a alguien le quedarán buenas? Porque veo que en los dramas siempre elogian a las personas con caras pequeñas >_<.